Earlier this year, the Motorcycle Industry Council released the findings of a survey that showed a record 8 percent of households had at least one motorcycle in 2018. But perhaps even more exciting (at least for those of us who love riding) was a survey showing women riders now make up 19 percent of all motorcyclists - a dramatic shift in just 10 years. Indeed, more men and women have taken up the joy of riding whether for commuting, long excursions on back country roads or both. Women riders have, no doubt, through the years witnessed the double-take from those in cages as they rolled by but as female riders slowly remove any remaining stigma that motorcycles are a man's machine they too need to learn to ride. Lorri Carney got her start as an adult, first as a pillion (passenger) then as pilot. Prior to her first ride, Carney had no interest in saddling up. EVER. 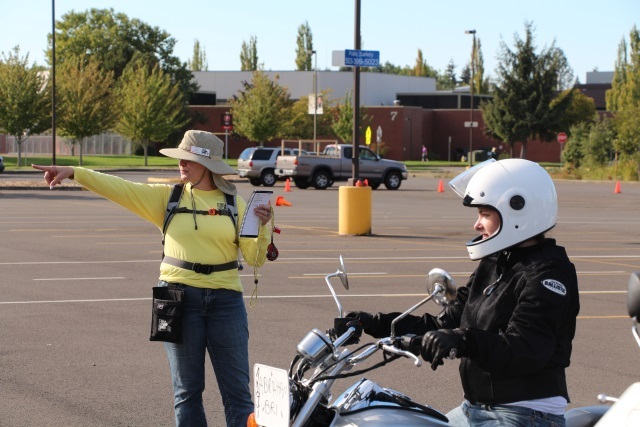 Today, she handles instructor duties with Team Oregon where residents in the State of Oregon must obtain their "Motorcycle Endorsement" in order to ride legally. Oregon is one of five states that require mandatory training. MotoSport sat down with Carney to talk about what else? Motorcycles! And, from where all these women riders come. Now 13 years a pilot, Carney has owned six motorcycles, has named them (well, all except one) and clearly has a love for riding that only a motorcyclist can attest. How many motorcycles have you owned? Favorite motorcycle: The Tiger. My boyfriend was on me for a year to ride his and I refused to do so because "it was too tall." He talked me into going to test ride the new ones at a dealership and I reluctantly agreed. One right turn around the block and I couldn't keep from smiling with my teeth out. I had found the bike that suit me to perfection. Type of riding: Some commuting to my regular job. Riding to teach. Touring type riding as vacations. Ride anything else? This last year I rode four-wheelers for the first time. It is definitely a different style of riding than street riding. Years as an instructor with Team Oregon? Since 2011. 1. How did you get started riding motorcycles? I met a man that rode motorcycles. I was terrified to ride, but he was a Team Oregon Instructor and a safe, thoughtful rider that "walked the talk" of the safety program. I felt safe as his pillion. 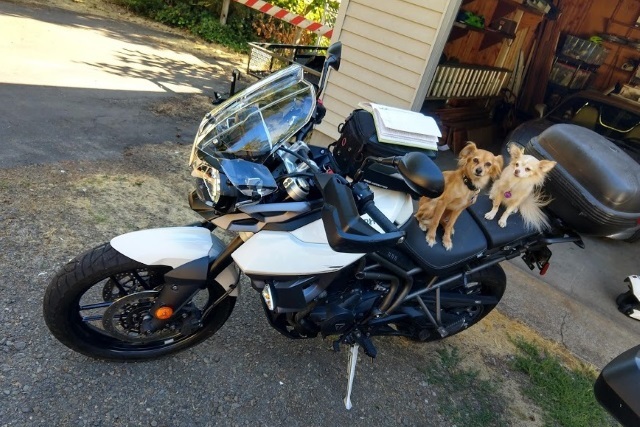 Eventually he bought a motorcycle for me and I took the Basic Rider class. 2. What interested you about riding? Actually, to begin with, I was NOT interested in riding what-so-ever. I had been frightened, as a pillion, many years before. You really couldn't pay me enough to get on a motorcycle. 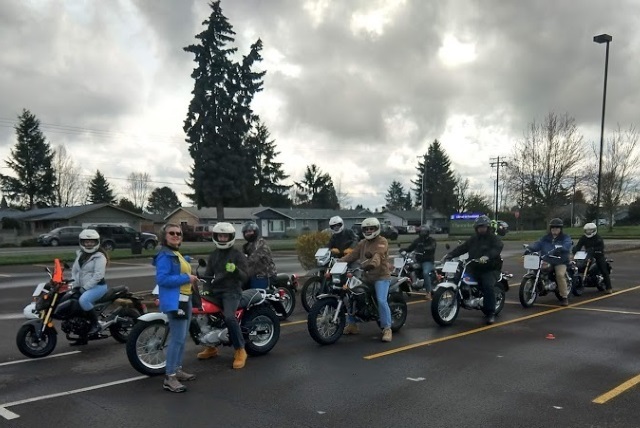 Through patience of a caring and safe riding partner and the Team Oregon "family" it started to seem like a fun activity to take part in. 3. What was hardest for you when learning to ride? Counter steering, I couldn't do it. My elbows would lock up and I couldn't press on the handgrips. I would pull with the opposite hand to get the same effect and make the bike lean. 4. How did you resolve this? For the short run, I pulled with the opposite arm to simulate the push on the handgrip in the direction I wanted to go. I had been riding for two weeks, after getting my endorsement, when I accidently counter steered. That was my "AH-HA" moment - "oh! that is what it is supposed to feel like." I believe it was when my brain got out of its own way. 5. Is it a common problem for first time riders? It can be a problem for new riders, usually ones that have some experience or have talked about counter steering with experienced riders. If someone is super new to riding, I have found that they just do what is asked of them. They have no reason to disbelieve what you tell them will work. 6. Like many owners, you name your motorcycle. How did you come up with the names? I am not a "vehicle" person. I don't get all wrapped up in machinery. For instance, I have never named any of my sewing machines. When it came to riding I asked why people named their bikes. I thought it was weird. I was told, "The bike will whisper her name to you." I have found it to be true. The only bike that didn't tell me her name was my KLR. I actually wanted to give my Tiger a different name, but she insisted on Gwendolyn. 7. It's not often you see a woman riding a motorcycle, why do you think motorcycle riding doesn't appeal more to women? Actually, in the last few years I see more and more ladies out riding their own motorcycles. I have certainly seen more ladies coming through the classes. I believe that when ladies are in the thick of mothering children they worry more about "what if's" or are just too busy raising those little ones. 8. To your point, a recent report shows more and more women riding. Why do you think this is? Less stigma for a woman to pilot her own bike. More gear options, more lady's riding groups. Many "early adopters" have already paved the way and there are established groups that we ladies can join. 9. Do you ever get double-takes from others on the road? Sometimes, especially when my hair was really long in a braid. If my chin bar is down, I'm not really sure that they know I am a female while on the motorcycle. 10. 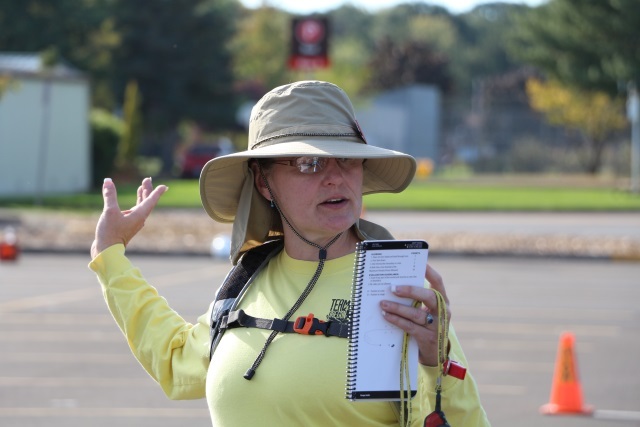 As a trainer with Team Oregon are you seeing more women coming through? In training classes, 23% of our beginners are women. It certainly seems like women are much more into riding these days than they used to be. 11. What made you want to get into the instructing side of things? Living with my boyfriend, who is an instructor, I would be around the larger Team Oregon family. They would often joke about when was I going to become an instructor. I was always too busy. Then one day I decided that I was always going to be too busy and I just went for it. Best decision I ever made! 12. Do you primarily teach women? No. I teach whoever signs up for the class. It is still a majority of men. 13. Do you think women in the program feel more at ease with you there? I would like to think so, but honestly it isn't always the case. Some women are actually intimidated by women instructors. I do my best to be encouraging and meet each student where they are at. People do bring their own perceptions with them though, and I try to be sensitive to those as well. 14. 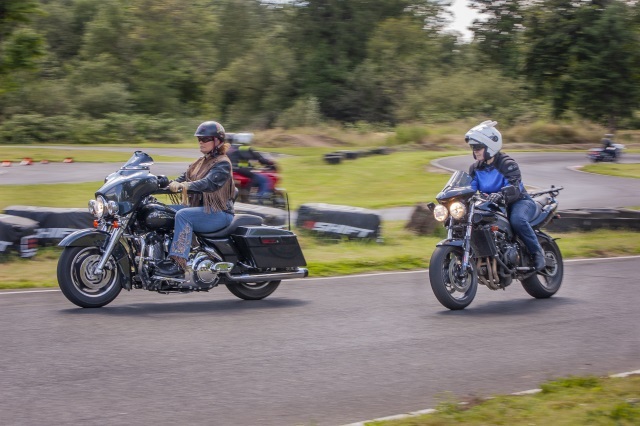 As an instructor, do you find women and men struggling with the same issues when learning to ride or do women tend to struggle in one area while men have difficulty in another? As an instructor I have found that people each have their own struggles and we need to meet them where they are at. My coaching for one student would be different from the next. I might celebrate a victory of one student's mastery of a simple skill that they have been struggling with while I would be asking another student for "more" of something and then celebrate that victory with them when they get there. That makes it sound as if I am withholding approval from some and not others, but that is not the case. I do see that people get nervous. Ladies don't want to look bad in front of dudes and dudes don't want to look bad in front of ladies. Older people don't want to look bad in front of young people. Not everyone is cut out to ride, but those lines aren't specifically drawn down male/female lines. 15. What advice would you give a woman who is interested in riding but has never been on a motorcycle before? The best advice that I could give anyone, would be to take a Team Oregon class. 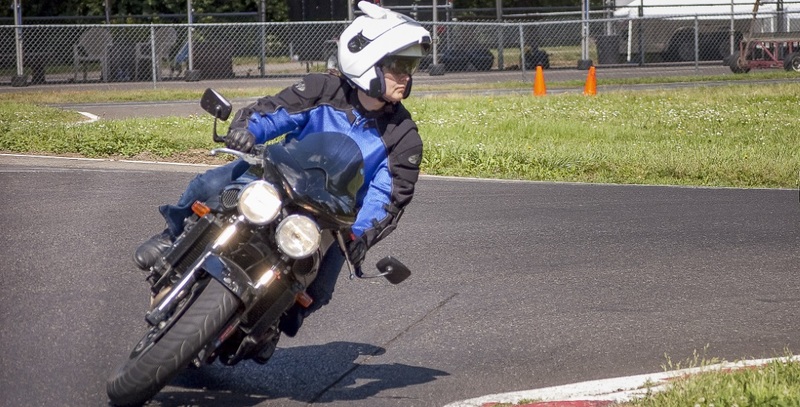 Or for those who aren't lucky enough to live in Oregon, take a state-sponsored beginner course - I think most states offer a Basic Rider Course (BRC). In discussing the risks of riding and ways to manage those risks, it has really empowered me as a rider. To know that in many instances, I have learned skills that put me in control to avoid potential accidents. 16. Lastly, what do you enjoy about riding a motorcycle? I enjoy riding for the joy and freedom that I feel when riding. I like the challenge of packing a motorcycle for an extended trip. I like that I have a modicum of control over the operation and performance of my bike. I like feeling the changes in temperature between the shadows and sunlight. I like smelling a flowering lilac bush alongside the road or the ripe strawberries in the fields. I like to constantly strive to improve my riding skills. I enjoy the camaraderie of other riders. I like, at the end of a long ride, to take off my gear and bask in the glory of a ride well ridden.